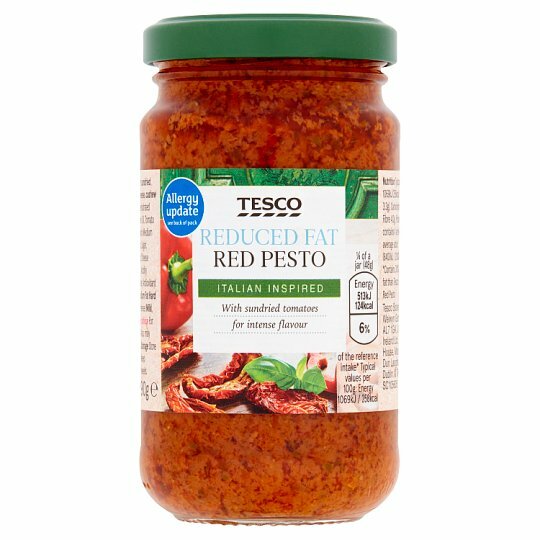 Reduced fat red pesto made with sundried tomatoes, basil, Grana Padano cheese, cashew nuts and pine nuts. Rehydrated Sundried Tomatoes (26%), Sunflower Oil, Tomato Purée, Water, Basil (7%), Grana Padano Medium Fat Hard Cheese (6%), Red Peppers, Sugar, Pecorino Romano Medium Fat Hard Cheese (Milk), Cashew Nut, Salt, Pine Nuts, Acidity Regulator (Lactic Acid), Garlic Powder, Antioxidant (Ascorbic Acid). Grana Padano Medium Fat Hard Cheese contains: Grana Padano Cheese (Milk), Preservative (Egg Lysozyme). Store in a cool dry place., Once opened, keep refrigerated and consume within 2 weeks.